Your BBQ is the focal point of all garden gatherings, so when the pressure is on the chef to get the food right, investing in the best gas BBQ that’s easy to cook on is probably high on the priority list. New style gas BBQs are much easier to regulate than their older counterparts and with some clever usage, they can still infuse food with that yummy smokey flavour that epitomises all summer parties. For our round up of the best barbecues (charcoal, gas, smokers, portable and even pizza and electric grills), see our buyer's guide. Find out how to barbecue like a pro in our advice guide, too. For more product recommendations and advice on how to style your garden for the summer, head to our garden hub page. Gas BBQs with multiple burners are the best. You can seal your food on the heat, then turn half the burners off, close the lid and allow your food to cook super slowly off the direct heat. The Weber Genesis II LX S-640 is the king of all BBQs, with 6 burners for careful cooking control and Flavorizer bars to help circulate smoke produced from dripping meat juices and marinades. An alternative to the regular gas BBQ is the CHAR-BROIL THE BIG EASY – an incredibly easy to use smoker that’ll allow you to sit back and relax with your guests while it does all the grafting – heaven! Designed by our grill fanatic friends on the other side of the pond, there’s no surprise that Weber Genesis rules over all. With up to 6 burners, this BBQ is a must for regular hosts of large summer gatherings. It should defy all myths that gas BBQs can’t produce as much flavour as charcoal, thanks to its cleverly designed Flavorizor bars. 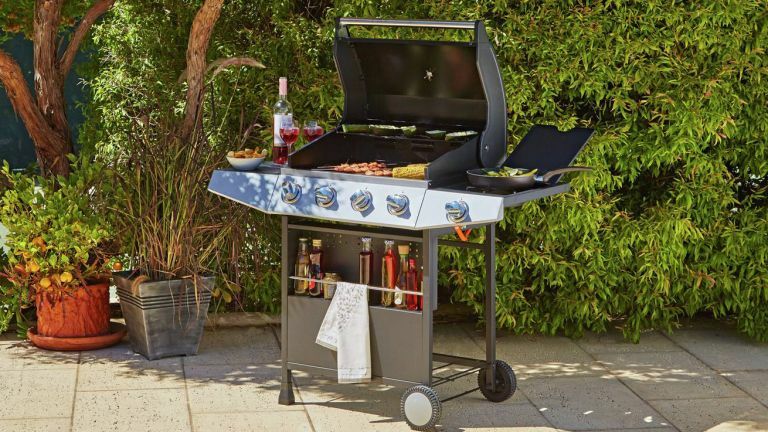 And with a grease management system, 2 handy side panels for food prep and a cabinet to store everything you need to serve, there’s everything you need for a seamless summer party. Best smoker gas BBQ: Who says hosting a large gathering has to be hard? Leave your joints of meat to slowly tenderise and infuse with smoky flavour as you enjoy the full swing of your party thanks to this best gas BBQ. The handy roasting basket lets you slowly cook whole chickens and lamb legs, alternatively, you can hook racks of ribs to the basket and there’s a grill for placing smaller cuts of meat such as sausages and chicken wings. For an easy and healthy way to feed the five thousand, invest in this handy smoker. Heston Blumenthal is a force to be reckoned with when it comes to cookery gadgets, whether it’s his Sage range or this rather snazzy gas BBQ. There’s two burners, so you should have ample control over the heat, and you also have the option to cook with the hood off or on, enabling you to infuse your food with the smoky flavour which charcoal BBQs are more renowned for. Available to purchase in Graphite, Mint and Red, this best gas barbecue would make the perfect addition to a patio, decking or balcony. There’s no denying that its older brother will set you back a fair bit. So, if you’re keen on its key features, you should find Weber Genesis II E-310 comes with everything you need. While there’s a compromise on the amount of gas burners, it still features the Flavorisor bars, which are essential to recreating that charred flavour that charcoal BBQs are renowned for. Featuring a porcelain enamel grease tray for easy cleaning and plenty of prep area, this is the best gas BBQ to use when catering for large gatherings. Featuring four gas burners plus an extra for a saucepan (creating the BBQ season’s best hot dog has never been easier), this is the ultimate outdoor cooking cooking station. There’s a warming rack to keep food hot and plenty of space on the grill to cook for your guests. An additional bonus is the condiments shelf and you can lower the lid over the external saucepan hob ring to create additional prep area. The best gas BBQ for those on a budget, we think. This clever little BBQ allows you to seal and slowly cook meat without overly charing everything. The flip funnel enables you to switch the flame from direct to indirect, so you can still control the heat, even with just one burner. Its design is small and compact, making it the best gas BBQ for patio areas, deckings and even balconies, although those who regularly host garden parties may need to go for something bigger.